We’d love your help. Let us know what’s wrong with this preview of Do You Have a Cat? by Eileen Spinelli. To ask other readers questions about Do You Have a Cat?, please sign up. Be the first to ask a question about Do You Have a Cat? The narrator asks the reader/listener a simple question (Do you have a cat?) and at the same time, introduces us to famous persons' cats. I bet you didn't know that Queen Victoria had a cat! What I thought: What a fun way for kids to "meet" historical figures. I had no idea these people owned cats. The illustrations are wonderful--bright, colorful, and appealing. My favorite illustration is of Domenico Scarlatti. I like how the cats look like their owners. This is a cute book about people in history who have had cats. It talks about the history of cats and how they have always been around. The book introduces many people and important facts related to their life along with including cute pictures of cats. I would use this book to read to the class before starting an art project regarding the style of paintings relating to the illustrators pictures in the book. i may be biased toward this book to begin with because I am not a fan of cats. While this book is cleverly written with some great historiacal references, I'm not sure that young kids will really get this book. Neither my son or my daughter cared for this book, but they may have sensed my lack of preference for the book. Not a fave for sure. Although I like the concept of introducing children to famous historical figures (who had cats), I could not help but think that the average pre-schooler-to 2nd grader would be pretty clueless about those historical figures...some seemed a little obscure, even to this adult. Nonetheless, it could perhaps spark interest in those figures for the right inquisitive child. We are dog people but liked this book. It was neat to find out that some famous people had cats & meant so much to them. The inside & back cover gave little synopses about each famous person with their cat. 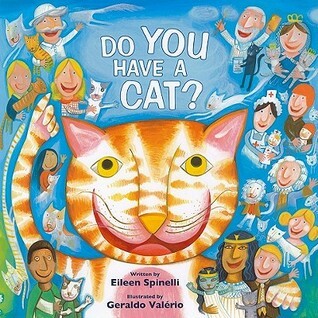 Might be a cool book for older kids who love cats, didn't get a higher rating from me mainly because it's such a specific subject that I wouldn't use it for a storytime, but I wouldn't hesitate to recommend it to a cat lover. Loved learning about famous people and their cats. This is not just a silly little book about cats, it also has some silly history and bright colorful illustrations. I quite enjoyed it, though it might have been better if it was about dogs. Like the rhyming text, but I didn't care for the illustrations. I loved the fact that it highlighted "famous" cat owners. Too lengthy for a storytime, but great historical figure tie-ins! An entertaining collection of facts about famous people and their feline companions. Delightful illustrations. Cute idea. Most kids don't know most of the people in the book. Explains who most are, context issue? Might be fun to look them up together. Now, my girls want a cat. Too bad their Dad is allergic to cats! If you're a person who likes cats, you'll love this story. I liked the smidgen of biographical info too. This book contains one of EJP's favorite things - cats - and history; it tells about people in history who had cats; I thought it was kind of neat. Trivia About Do You Have a Cat?